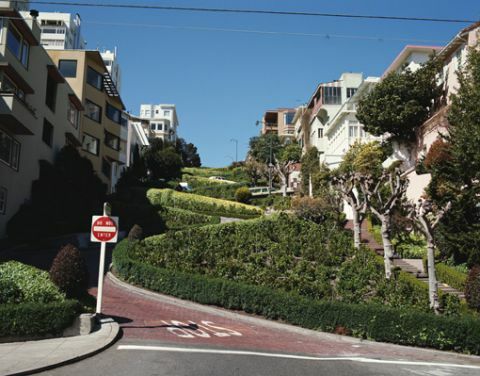 Lombard Street is the crookedest street in San Francisco and in all of America. It is located in the Russian Hill area and was developed in 1922 to help maintain safety while traversing this very steep road. The street is created from red brick and has eight sharp curves and switchbacks all the way down a one-way street. Victorian houses, townhouses, condos, and gardens add to the ambience. Lombard Street is an incredible tourist attraction, and many photographers stand at the bottom looking for a special shot. Lombard Street runs from The Presidio, with the Russian Hill section partway along it, and ends at The Embarcadero. The Powell-Hyde cable car stops at the top of the Lombard Street hill. No parking is allowed on the street during the summer months. • California - Find travel information, maps, tourist resources, and more photos of California. • San Francisco SFGov - Welcome to the official San Francisco City and County government web site. • Only in San Francisco - Official travel guide to hotels, restaurants, activities, maps and more.